You’re going to spend a lot less on décor if your venue is already a beautiful space on its own. Summer weddings need look no further than outdoor gardens (add wrought iron chairs, colourful seating cushions and flowers), and if heading indoors – look out for dramatic features like ornate fireplaces or chandeliers. Sales have bargains on décor. Always add an atmosphere of intimacy – think containers, different heights etc. To add a touch of vintage. This works well for picnics or summer tea party weddings. And easy to come by – raid your relatives’ and friends’ shelves, or the racks of antique shops. Not only do sprigs of rosemary, lavender, comfrey and tea tree look incredible, but they also smell wonderful. This form does away with rows and sides, and is aesthetically interesting. 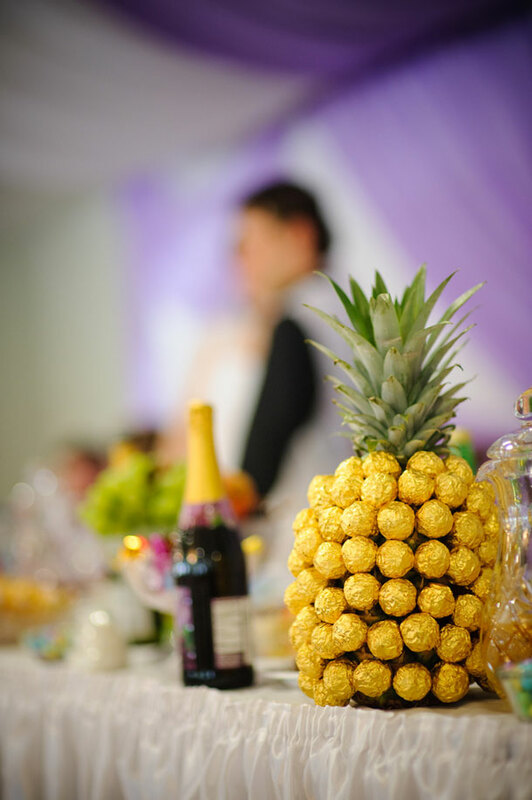 If the dessert table is beautifully arranged, or colourfully done, it can function as the focal point of the reception. This works beautifully out of doors or indoors, and won’t stress the budget. To guide people to the wedding, to tell them about the food tables, to mark the seating arrangement etc. Of the couple during their relationship and during the childhoods – this helps fill wall space and tells a story. Choose one bright contrasting colour – lemon yellow, sage pink, pale blue – and find all your décor in that colour. If you can find a venue out of doors where the tree is the focus of the wedding ceremony, or better still, use the tree as the fulcrum of the reception – simply add Bedouin tent and fairy lights.